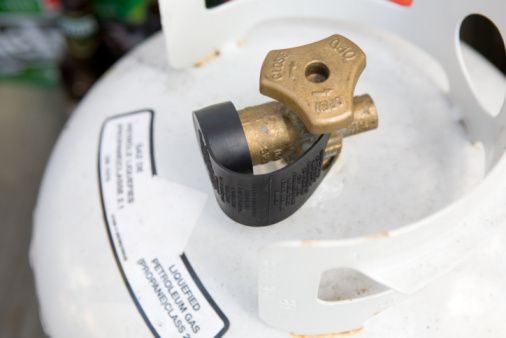 A propane tank lock protects the contents of the tank from being used or released. While the lock does not prevent the tank itself from being moved, it renders the tank unusable. The locks are useful for your propane tanks that aren't used often, or aren't in a secure area. You can only remove the lock with the matching key, but it is important to do so properly to avoid injury or damages. Propane tank locks prevent the propane from being accessed. Turn the propane valve, until it is completely closed. Locate the lock mechanism on the tip of the propane valve. You will find it coming off of one side of the top of the tank's valve housing. Insert the propane lock key into the key hole on the front of the lock mechanism. Turn the key counterclockwise, until the lock cover comes off and the valve is accessible. Try clockwise, if the lock cover does not come off.